For other uses, see El Salvador (disambiguation). The United States dollar is the currency in use. Financial information can be expressed in U.S. dollars and in Salvadoran colón, but the colón is out of circulation. Telephone companies (market share): Tigo (45%), Claro (25%), Movistar (24%), Digicel (5.5%), Red (0.5%). El Salvador (/ɛl ˈsælvədɔːr/ ( listen); Spanish: [el salβaˈðoɾ]), officially the Republic of El Salvador (Spanish: República de El Salvador, literally "Republic of The Savior"), is the smallest and the most densely populated country in Central America. It is bordered on the northeast by Honduras, on the northwest by Guatemala, and on the south by the Pacific Ocean. El Salvador's capital and largest city is San Salvador. As of 2016[update], the country had a population of approximately 6.34 million. El Salvador was for centuries inhabited by several Mesoamerican nations, especially the Cuzcatlecs, as well as the Lenca and Maya. In the early 16th century, the Spanish Empire conquered the territory, incorporating it into the Viceroyalty of New Spain ruled from Mexico City. However the Viceroyalty of Mexico had little or no influence in the daily affairs of the Central American isthmus, which would be colonized in 1524. In 1609 the area became the Captaincy General of Guatemala, from which El Salvador was part of until its independence from Spain, which took place in 1821, as part of the First Mexican Empire, then further seceded, as part of the Federal Republic of Central America, in 1823. When the Republic dissolved in 1841, El Salvador became a sovereign nation, then formed a short-lived union with Honduras and Nicaragua called the Greater Republic of Central America, which lasted from 1895 to 1898. From the late 19th to the mid-20th century, El Salvador endured chronic political and economic instability characterized by coups, revolts, and a succession of authoritarian rulers. Persistent socioeconomic inequality and civil unrest culminated in the devastating Salvadoran Civil War (1979–1992), which was fought between the military-led government and a coalition of left-wing guerrilla groups. The conflict ended with the Chapultepec Peace Accords. This negotiated settlement established a multiparty constitutional republic, which remains in place to this day. El Salvador's economy has historically been dominated by agriculture, beginning with the indigo plant (añil in Spanish), the most important crop during the colonial period, and followed thereafter by coffee, which by the early 20th century accounted for 90 percent of export earnings. El Salvador has since reduced its dependence on coffee and embarked on diversifying the economy by opening up trade and financial links and expanding the manufacturing sector. The colón, the official currency of El Salvador since 1892, was replaced by the U.S. dollar in 2001. As of 2010[update], El Salvador ranks 12th among Latin American countries in terms of the Human Development Index and fourth in Central America (behind Panama, Costa Rica, and Belize) due in part to ongoing rapid industrialisation. However, the country continues to struggle with high rates of poverty, inequality, and crime. Conquistador Pedro de Alvarado named the new province for Jesus Christ – El Salvador ("The Savior"). The full name was "Provincia De Nuestro Señor Jesus Cristo, El Salvador Del Mundo" ("Province of our Lord Jesus Christ, the Savior of the World"), which was subsequently abbreviated to "El Salvador" (The Savior). Excavation of a Megatherium in the Tomayate site Apopa. Skull fossil of an ancient-horse in the Tomayate site Apopa. Tomayate is a paleontological site located on the banks of the river of the same name in the municipality of Apopa. The site has produced abundant Salvadoran megafauna fossils belonging to the Pleistocene epoch. The paleontological site was discovered accidentally in 2000, and in the following year, an excavation by the Museum of Natural History of El Salvador revealed not only several remnants of Cuvieronius, but also several other species of vertebrates. In the Tomayate site, they have recovered at least 19 species of vertebrates, including giant tortoises, Megatherium, Glyptodon, Toxodon, extinct horses, paleo-llamas and especially a large number of skeletal remains of proboscis genus Cuvieronius. The Tomayate site stands out from most Central American Pleistocene deposits, being more ancient and much richer, which provides valuable information of the Great American Interchange, in which the Central American isthmus landbridge played the title primordial role. At the same time, it is considered the richest vertebrate paleontological site in Central America and one of the largest accumulations of proboscideans in the Americas. Temazcal in Joya de Ceren. Sophisticated civilization in El Salvador dates to its settlement by the indigenous Lenca people; theirs was the first and the oldest indigenous civilization to settle in El Salvador. The Lenca were succeeded by the Olmecs, who eventually also disappeared, leaving their monumental architecture in the form of the pyramids still extant in western El Salvador. The Maya arrived and settled in place of the Olmecs, but their numbers were greatly diminished when the Ilopango supervolcano eruption caused a massive Mayan exodus out of what is now El Salvador. Centuries later they themselves were replaced by the Pipil people, Nahua speaking groups who migrated from Mexico in the centuries before the European conquest and occupied the central and western regions. The Pipil were the last indigenous people to arrive in El Salvador. They called their territory Kuskatan, a Pipil word meaning The Place of Precious Jewels, backformed into Classical Nahuatl Cōzcatlān, and Hispanicized as Cuzcatlán. The people of El Salvador today are referred to as Salvadoran, while the term Cuzcatleco is commonly used to identify someone of Salvadoran heritage. In pre-Columbian times, the country was also inhabited by various other indigenous peoples, including the Lenca, a Chilanga Lencan-speaking group who settled in the eastern highlands. Cuzcatlan was the larger domain until the Spanish conquest. Since El Salvador resided on the eastern edge of the Maya Civilization, the origins of many of El Salvador's ruins are controversial. However, it is widely agreed that Mayas likely occupied the areas around Lago de Guija and Cihuatán. Other ruins such as Tazumal, Joya de Cerén and San Andrés may have been built by the Pipil or the Maya or possibly both. By 1521, the indigenous population of the Mesoamerican area had been drastically reduced by the smallpox epidemic that was spreading throughout the territory, although it had not yet reached pandemic levels in Cuzcatlán. The first known visit by Spaniards to what is now Salvadoran territory was made by the Spanish admiral, Andrés Niño, who led a Spanish expedition to Central America. He disembarked in the Gulf of Fonseca on May 31, 1522, at Meanguera island, naming it Petronila, and then discovered Jiquilisco Bay on the mouth of Lempa River. The first indigenous people to have contact with the Spanish were the Lenca of eastern El Salvador. Spanish Conquistador Pedro de Alvarado. In 1524, after participating in the conquest of Mexico, Spanish conquistadors led by Pedro de Alvarado and his brother Gonzalo crossed the Rio Paz (Peace River) from the area comprising the present Republic of Guatemala into what is now the Republic of El Salvador. The Spaniards were disappointed to discover that the indigenous Pipil people had no gold or jewels like those they had found in Guatemala or Mexico, but recognized the richness of the land's volcanic soil. Pedro de Alvarado led the first incursion by Spanish forces to extend their dominion to the nation of Cuzcatlan (El Salvador), in June 1524. When he arrived at the borders of the Cuzcatlan kingdom he saw that civilians had been evacuated. Cuzcatlec warriors moved to the coastal city of Acajutla and waited for Alvarado and his forces. Alvarado approached, confident that the result would be similar to what occurred in Mexico and Guatemala where the people believed the Spanish were gods. He thought he would easily defeat this new indigenous force since his Mexican allies and the Pipil of Cuzcatlan spoke a similar language. The Indigenous peoples of El Salvador did not see the Spanish as gods, but as foreign invaders. Alvarado saw that the Cuzcatan force outnumbered his Spanish soldiers and Mexican Indian allies. The Spanish withdrew and the Cuzcatlec army attacked, running behind them with war chants and shooting bow arrows. Alvarado had no choice but to fight to survive. Alvarado described the Cuzcatlec soldiers in great detail as having shields made of colorful exotic feathers, a vest-like armor made of three inch cotton which arrows could not penetrate, and large spears. Both armies suffered many casualties, with a wounded Alvarado retreating and losing a lot of his men, especially among the Mexican Indian auxiliaries. Once his army had regrouped, Alvarado decided to head to the Cuzcatlan capital and again faced armed Cuzcatlec. Wounded, unable to fight and hiding in the cliffs, Alvarado sent his Spanish men on their horses to approach the Cuzcatlec to see if they would fear the horses, but they did not retreat, Alvarado recalls in his letters to Hernan Cortez. The Cuzcatlec attacked again, and on this occasion stole Spanish weaponry. Alvarado retreated and sent Mexican Indian messengers to demand that the Cuzcatlec warriors return the stolen weapons and surrender to the Spanish king. The Cuzcatlec responded with the famous response, "If you want your weapons, come get them". As days passed, Alvarado, fearing an ambush, sent more Mexican Indian messengers to negotiate, but these messengers never came back and were presumably executed. Tazumal ruins in Santa Ana, El Salvador. The Spanish efforts were firmly resisted by the indigenous people, including the Pipil and their Mayan-speaking neighbors. They defeated the Spaniards and what was left of their Mexican Tlaxcala Indian allies, forcing them to withdraw to Guatemala. After being wounded, Alvarado abandoned the war and appointed his brother, Gonzalo de Alvarado, to continue the task. 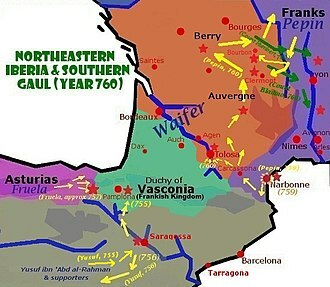 Two subsequent expeditions (the first in 1525, followed by a smaller group in 1528) brought the Pipil under Spanish control, since the Pipil also were weakened by a regional epidemic of smallpox. In 1525, the conquest of Cuzcatlán was completed and the city of San Salvador was established. The Spanish faced much resistance from the Pipil and were not able to reach eastern El Salvador, the area of the Lencas. In 1526 the Spanish founded the garrison town of San Miguel, headed by another explorer and conquistador, Luis de Moscoso Alvarado, nephew of Pedro Alvarado. Oral history holds that a Maya-Lenca crown princess, Antu Silan Ulap I, organized resistance to the conquistadors. The kingdom of Lenca was alarmed by de Moscoso's invasion, and Antu Silan travelled from village to village, uniting all the Lenca towns in present-day El Salvador and Honduras against the Spaniards. Through surprise attacks and overwhelming numbers, they were able to drive the Spanish out of San Miguel and destroy the garrison. For ten years the Lencas prevented the Spanish from building a permanent settlement. Then the Spanish returned with more soldiers, including about 2,000 forced conscripts from indigenous communities in Guatemala. They pursued the Lenca leaders further up into the mountains of Intibucá. Antu Silan Ulap eventually handed over control of the Lenca resistance to Lempira (also called Empira). Lempira was noteworthy among indigenous leaders in that he mocked the Spanish by wearing their clothes after capturing them and using their weapons captured in battle. Lempira fought in command of thousands of Lenca forces for six more years in El Salvador and Honduras until he was killed in battle. The remaining Lenca forces retreated into the hills. The Spanish were then able to rebuild their garrison town of San Miguel in 1537. A painting of the First Independence Movement celebration in San Salvador. At the center, José Matías Delgado. Manuel José Arce joined the movement for independence from Spain, joining in the first Cry for Independence on November 5, 1811 in San Salvador. During the colonial period, El Salvador was part of the Captaincy General of Guatemala, also known as the Kingdom of Guatemala (Spanish: Reino de Guatemala), created in 1609 as an administrative division of New Spain. The Salvadoran territory was administered by the Mayor of Sonsonate, with San Salvador being established as an intendancia in 1786. Towards the end of 1811, a combination of internal and external factors motivated Central American elites to attempt to gain independence from the Spanish Crown. The most important internal factors were the desire of local elites to control the country's affairs free of involvement from Spanish authorities, and the long-standing Creole aspiration for independence. 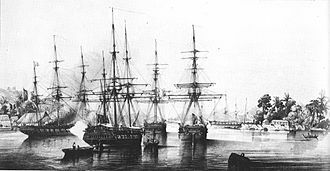 The main external factors motivating the independence movement were the success of the French and American revolutions in the 18th century, and the weakening of the Spanish Crown's military power as a result of the Napoleonic Wars, with the resulting inability to control its colonies effectively. 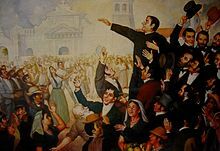 In November 1811 Salvadoran priest José Matías Delgado rang the bells of Iglesia La Merced in San Salvador, calling for insurrection and launching the 1811 Independence Movement. This insurrection was suppressed and many of its leaders were arrested and served sentences in jail. Another insurrection was launched in 1814, and again this insurrection was also suppressed. 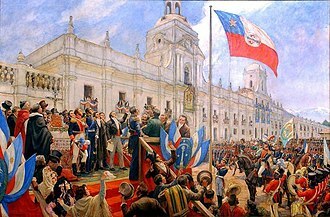 In 1821 in light of unrest in Guatemala, Spanish authorities capitulated and signed the Act of Independence of Central America, which released all of the Captaincy of Guatemala (comprising current territories of Guatemala, El Salvador, Honduras, Nicaragua and Costa Rica and the Mexican state of Chiapas) from Spanish rule and declared its independence. In 1821, El Salvador joined Costa Rica, Guatemala, Honduras and Nicaragua in a union named the Federal Republic of Central America. When the Federal Republic of Central America dissolved in 1841, El Salvador maintained its own government until it joined Honduras and Nicaragua in 1896 to form the Greater Republic of Central America, which dissolved in 1898. After the mid-19th century, the economy was based on coffee growing. As the world market for indigo withered away, the economy prospered or suffered as the world coffee price fluctuated. The enormous profits that coffee yielded as a monoculture export served as an impetus for the concentration of land into the hands of an oligarchy of just a few families. Throughout the last half of the 19th century, a succession of presidents from the ranks of the Salvadoran oligarchy, nominally both conservative and liberal, generally agreed on the promotion of coffee as the predominant cash crop, the development of infrastructure (railroads and port facilities) primarily in support of the coffee trade, the elimination of communal landholdings to facilitate further coffee production, the passage of anti-vagrancy laws to ensure that displaced campesinos and other rural residents provided sufficient labor for the coffee fincas (plantations), and the suppression of rural discontent. In 1912, the national guard was created as a rural police force. In 1898, Gen. Tomas Regalado gained power by force, deposing Rafael Antonio Gutiérrez and ruling as president until 1903. Once in office he revived the practice of presidents designating their successors. After serving his term, he remained active in the Army of El Salvador, and was killed July 11, 1906, at El Jicaro during a war against Guatemala. Until 1913 El Salvador was politically stable, with undercurrents of popular discontent. When President Dr. Manuel Enrique Araujo was killed in 1913, many hypotheses were advanced for the political motive of his murder. Dios, Union, Libertad (God, Union, Liberty) El Salvador 1912 Flag. Araujo's administration was followed by the Melendez-Quinonez dynasty that lasted from 1913 to 1927. Pio Romero Bosque, ex-Minister of the Government and a trusted collaborator of the dynasty, succeeded President Jorge Meléndez and in 1930 announced free elections, in which Arturo Araujo came to power on March 1, 1931 in what was considered the country's first freely contested election. His government lasted only nine months before it was overthrown by junior military officers who accused his Labor Party of lacking political and governmental experience and of using its government offices inefficiently. President Araujo faced general popular discontent, as the people had expected economic reforms and the redistribution of land. There were demonstrations in front of the National Palace from the first week of his administration. His vice president and minister of war was Gen. Maximiliano Hernández Martínez. In December 1931, a coup d'état organized by junior officers and led by Gen. Martínez started in the First Regiment of Infantry across from the National Palace in downtown San Salvador. 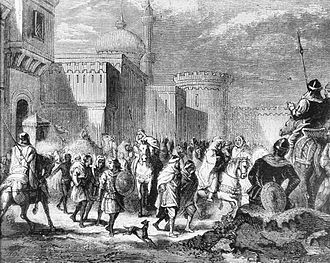 Only the First Regiment of Cavalry and the National Police defended the presidency (the National Police had been on its payroll), but later that night, after hours of fighting, the badly outnumbered defenders surrendered to rebel forces. The Directorate, composed of officers, hid behind a shadowy figure, a rich anti-Communist banker called Rodolfo Duke, and later installed the ardent fascist Gen. Martínez as president. The revolt was probably due to the army's discontent at not having been paid by President Araujo for some months. Araujo left the National Palace and unsuccessfully tried to organize forces to defeat the revolt. The U.S. Minister in El Salvador met with the Directorate and later recognized the government of Martínez, which agreed to hold presidential elections. He resigned six months prior to running for re-election, winning back the presidency as the only candidate on the ballot. He ruled from 1935 to 1939, then from 1939 to 1943. He began a fourth term in 1944, but resigned in May after a general strike. Martínez had said he was going to respect the Constitution, which stipulated he could not be re-elected, but he refused to keep his promise. From December 1931, the year of the coup that brought Martínez to power, there was brutal suppression of rural resistance. The most notable event was the February 1932 Salvadoran peasant uprising, originally led by Farabundo Martí and Abel Cuenca, and university students Alfonso Luna and Mario Zapata, but these leaders were captured before the planned insurrection. Only Cuenca survived; the other insurgents were killed by the government. After the capture of the movement leaders, the insurrection erupted in a disorganized and mob-controlled fashion, resulting in government repression that was later referred to as La Matanza (The Massacre), because tens of thousands of peasants died in the ensuing chaos on the orders of President Martinez. In the unstable political climate of the previous few years, the social activist and revolutionary leader Farabundo Martí helped found the Communist Party of Central America, and led a Communist alternative to the Red Cross called International Red Aid, serving as one of its representatives. Their goal was to help poor and underprivileged Salvadorans through the use of Marxist-Leninist ideology (strongly rejecting Stalinism). In December 1930, at the height of the country's economic and social depression, Martí was once again exiled due to his popularity among the nation's poor and rumors of his upcoming nomination for President the following year. Once Arturo Araujo was elected president in 1931, Martí returned to El Salvador, and along with Alfonso Luna and Mario Zapata began the movement that was later truncated by the military. They helped start a guerrilla revolt of indigenous farmers. The government responded by killing over 30,000 people at what was to have been a "peaceful meeting" in 1932; this became known as La Matanza (The Slaughter). The peasant uprising against Martínez was crushed by the Salvadoran military ten days after it had begun. The Communist-led rebellion, fomented by collapsing coffee prices, enjoyed some initial success, but was soon drowned in a bloodbath. President Martínez, who had himself toppled an elected government only weeks earlier, ordered the defeated Martí shot after a perfunctory hearing. Historically, the high Salvadoran population density has contributed to tensions with neighboring Honduras, as land-poor Salvadorans emigrated to less densely populated Honduras and established themselves as squatters on unused or underused land. This phenomenon was a major cause of the 1969 Football War between the two countries. As many as 130,000 Salvadorans were forcibly expelled or fled from Honduras. The Christian Democratic Party (PDC) and the National Conciliation Party (PCN) were active in Salvadoran politics from 1960 until 2011, when they were disbanded by the Supreme Court because they had failed to win enough votes in the 2004 presidential election; Both parties have since reconstituted. They share common ideals, but one represents the middle class and the latter the interests of the Salvadoran military. PDC leader José Napoleón Duarte was the mayor of San Salvador from 1964 to 1970, winning three elections during the regime of PCN President Julio Adalberto Rivera Carballo, who allowed free elections for mayors and the National Assembly. Duarte later ran for president with a political grouping called the National Opposition Union (UNO) but was defeated in the 1972 presidential elections. He lost to the ex-Minister of Interior, Col. Arturo Armando Molina, in an election that was widely viewed as fraudulent; Molina was declared the winner even though Duarte was said to have received a majority of the votes. Duarte, at some army officers' request, supported a revolt to protest the election fraud, but was captured, tortured and later exiled. Duarte returned to the country in 1979 to enter politics after working on projects in Venezuela as an engineer. In October 1979, a coup d'état brought the Revolutionary Government Junta of El Salvador to power. It nationalized many private companies and took over much privately owned land. The purpose of this new junta was to stop the revolutionary movement already underway in response to Duarte's stolen election. Nevertheless, the oligarchy opposed agrarian reform, and a junta formed with young liberal elements from the army such as Gen. Majano and Gen. Gutierrez, as well as with progressives such as Guillermo Ungo and Alvarez. A billboard serving as a reminder of one of many massacres that occurred during the civil war. Pressure from the oligarchy soon dissolved the junta because of its inability to control the army in its repression of the people fighting for unionization rights, agrarian reform, better wages, accessible health care and freedom of expression. In the meantime, the guerrilla movement was spreading to all sectors of Salvadoran society. Middle and high school students were organized in MERS (Movimiento Estudiantil Revolucionario de Secundaria, Revolutionary Movement of Secondary Students); college students were involved with AGEUS (Asociacion de Estudiantes Universitarios Salvadorenos; Association of Salvadoran College Students); and workers were organized in BPR (Bloque Popular Revolucionario, Popular Revolutionary Block). In October 1980, several other major guerrilla groups of the Salvadoran left had formed the Farabundo Martí National Liberation Front, or FMLN. By the end of the 1970s, death squads were killing about 10 people each day, and the FMLN had 6,000 – 8,000 active guerrillas and hundreds of thousands of part-time militia, supporters, and sympathizers. ERP combatants in Perquín, 1990. The U.S. supported and financed the creation of a second junta to change the political environment and stop the spread of a leftist insurrection. Napoleón Duarte was recalled from his exile in Venezuela to head this new junta. 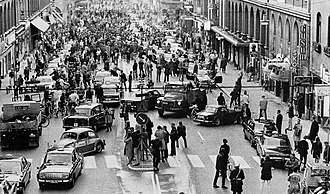 However, a revolution was already underway and his new role as head of the junta was seen by the general population as opportunistic. He was unable to influence the outcome of the insurrection. Óscar Romero, Archbishop of San Salvador, denounced injustices and massacres committed against civilians by government forces. He was considered "the voice of the voiceless", but he was assassinated by a death squad while saying Mass on 24 March 1980. Some consider this to be the beginning of the full Salvadoran Civil War, which lasted from 1980 to 1992. An unknown number of people "disappeared" during the conflict, and the UN reports that more than 75,000 were killed. The Salvadoran Army's US-trained Atlacatl Battalion was responsible for the El Mozote massacre where more than 800 civilians were murdered, over half of them children, the El Calabozo massacre, and the murder of UCA scholars. A reconstruction of Radio Venceremos, at the Museo de la Palabra y la Imagen, San Salvador. On January 16, 1992, the government of El Salvador, represented by president Alfredo Cristiani, and the FMLN, represented by the commanders of the five guerrilla groups – Shafik Handal, Joaquín Villalobos, Salvador Sánchez Cerén, Francisco Jovel and Eduardo Sancho, all signed peace agreements brokered by the United Nations ending the 12-year civil war. This event, held at Chapultepec Castle in Mexico, was attended by U.N. dignitaries and other representatives of the international community. After signing the armistice, the president stood up and shook hands with all the now ex-guerrilla commanders, an action which was widely admired. The so-called Chapultepec Peace Accords mandated reductions in the size of the army, and the dissolution of the National Police, the Treasury Police, the National Guard and the Civilian Defense, a paramilitary group. A new Civil Police was to be organized. Judicial immunity for crimes committed by the armed forces ended; the government agreed to submit to the recommendations of a Commission on the Truth for El Salvador (Comisión de la Verdad Para El Salvador), which would "investigate serious acts of violence occurring since 1980, and the nature and effects of the violence, and...recommend methods of promoting national reconciliation." In 1993 the Commission delivered its findings reporting human rights violations on both sides of the conflict. Five days later the El Salvadoran legislature passed an amnesty law for all acts of violence during the period. From 1989 until 2004, Salvadorans favored the Nationalist Republican Alliance (ARENA) party, voting in ARENA presidents in every election (Alfredo Cristiani, Armando Calderón Sol, Francisco Flores Pérez, Antonio Saca) until 2009, when Mauricio Funes was elected president from the Farabundo Martí National Liberation Front (FMLN) party. Economic reforms since the early 1990s brought major benefits in terms of improved social conditions, diversification of the export sector, and access to international financial markets at investment grade level. Crime remains a major problem for the investment climate. This[clarification needed] all ended in 2001, and support for ARENA weakened. Internal turmoil in ARENA weakened the party also, while the FMLN united and broadened its support. The unsuccessful attempts of the left-wing party to win presidential elections led to its selection of a journalist rather than a former guerrilla leader as a candidate. On March 15, 2009, Mauricio Funes, a television figure, became the first president from the FMLN party. He was inaugurated on June 1, 2009. One focus of the Funes government has been revealing the alleged corruption from the past government. ARENA formally expelled Saca from the party in December 2009. With 12 loyalists in the National Assembly, Saca established his own party, GANA (Gran Alianza por la Unidad Nacional or Grand Alliance for National Unity), and entered into a tactical legislative alliance with the FMLN. After three years in office, with Saca's GANA party providing the FMLN with a legislative majority, Funes had not taken action to either investigate or to bring corrupt former officials to justice. Early in the new millennium, El Salvador's government created the Ministerio de Medio Ambiente y Recursos Naturales – the Ministry of Environment and Natural Resources (MARN) and began promoting the integration of climate change into national policy. This move was in response to the increase in extreme weather events affecting the country. Initially MARN aimed to fulfil the country's obligations following its ratification of the UNFCCC and the Kyoto protocol However, since Hurricane Ida in 2009, the government's stance has shifted towards integrating risk reduction into all areas of policy, including financial. In a specific effort to increase the resilience of its economy and people to climate-related events, El Salvador commissioned a project in 2011 to develop and implement a National Policy and Strategy for Climate Change, which culminated with the launch of the National Environmental Policy in June 2012 and the National Environmental Strategy in June 2013, both incorporating climate change goals. This work was undertaken with support from the Climate & Development Knowledge Network. The government is now preparing action plans for putting the strategy into practice. El Salvador lies in the isthmus of Central America between latitudes 13° and 15°N, and longitudes 87° and 91°W. It stretches 270 km (168 mi) from west-northwest to east-southeast and 142 km (88 mi) north to south, with a total area of 21,041 km2 (8,124 sq mi). As the smallest country in continental America, El Salvador is affectionately called Pulgarcito de America (the "Tom Thumb of the Americas"). The highest point in El Salvador is Cerro El Pital, at 2,730 metres (8,957 ft), on the border with Honduras. El Salvador has a long history of destructive earthquakes and volcanic eruptions. The capital San Salvador was destroyed in 1756 and 1854, and it suffered heavy damage in the 1919, 1982, and 1986 tremors. 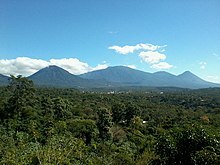 El Salvador has over twenty volcanoes, two of them, San Miguel and Izalco, active in recent years. From the early 19th century to the mid-1950s, Izalco erupted with a regularity that earned it the name "Lighthouse of the Pacific." Its brilliant flares were clearly visible for great distances at sea, and at night its glowing lava turned it into a brilliant luminous cone. El Salvador has over 300 rivers, the most important of which is the Rio Lempa. Originating in Guatemala, the Rio Lempa cuts across the northern range of mountains, flows along much of the central plateau, and cuts through the southern volcanic range to empty into the Pacific. It is El Salvador's only navigable river. It and its tributaries drain about half of the country's area. Other rivers are generally short and drain the Pacific lowlands or flow from the central plateau through gaps in the southern mountain range to the Pacific. These include the Goascorán, Jiboa, Torola, Paz and the Río Grande de San Miguel. There are several lakes enclosed by volcanic craters in El Salvador, the most important of which are Lake Ilopango (70 km²) and Lake Coatepeque (26 km²). Lake Güija is El Salvador's largest natural lake (44 km²). Several artificial lakes were created by the damming of the Lempa, the largest of which is Embalse Cerrón Grande (135 km²). There are a total 320 km2 (123.6 sq mi) of water within El Salvador's borders. El Salvador shares borders with Guatemala and Honduras, the total national boundary length is 546 km (339 mi): 126 miles (203 km) with Guatemala and 343 km (213 mi) with Honduras. It is the only Central American country that has no Caribbean coastline. The coastline on the Pacific is 307 km (191 mi) long. Two parallel mountain ranges cross El Salvador to the west with a central plateau between them and a narrow coastal plain hugging the Pacific. These physical features divide the country into two physiographic regions. The mountain ranges and central plateau, covering 85% of the land, comprise the interior highlands. The remaining coastal plains are referred to as the Pacific lowlands. El Salvador has a tropical climate with pronounced wet and dry seasons. Temperatures vary primarily with elevation and show little seasonal change. The Pacific lowlands are uniformly hot; the central plateau and mountain areas are more moderate. The rainy season extends from May to October; this time of year is referred to as invierno or winter. Almost all the annual rainfall occurs during this period; yearly totals, particularly on southern-facing mountain slopes, can be as high as 2170 mm. The best time to visit El Salvador would be at the beginning or end of the dry season. Protected areas and the central plateau receive less, although still significant, amounts. Rainfall during this season generally comes from low pressure systems formed over the Pacific and usually falls in heavy afternoon thunderstorms. Hurricanes occasionally form in the Pacific with the notable exception of Hurricane Mitch, which formed in the Atlantic and crossed Central America. From November through April, the northeast trade winds control weather patterns; this time of year is referred to as verano, or summer. During these months, air flowing from the Caribbean has lost most of its precipitation while passing over the mountains in Honduras. By the time this air reaches El Salvador, it is dry, hot, and hazy, and the country experiences hot weather, excluding the northern higher mountain ranges, where temperatures will be cool. In the extreme northeastern part of the country near Cerro El Pital, snow is known to fall during summer as well as during winter due to the high elevations (it is the coldest part of the country). 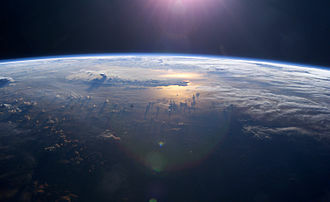 El Salvador's position on the Pacific Ocean also makes it subject to severe weather conditions, including heavy rainstorms and severe droughts, both of which may be made more extreme by the El Niño and La Niña effects. Severe deforestation and soil erosion have made the landscape vulnerable to landslides and forest fires. These characteristics, coupled with severe fiscal constraints, make the nation highly susceptible to the impacts of extreme weather events. In the summer of 2001 a severe drought destroyed 80% of El Salvador's crops, causing famine in the countryside. On October 4, 2005, severe rains resulted in dangerous flooding and landslides, which caused a minimum of fifty deaths. In 2010, losses to agriculture from flooding exceeded US$100 million, while those resulting from drought were US$38 million. El Salvador's location in Central America also makes it vulnerable to severe storms and hurricanes coming off the Caribbean. Since the 1990s, there has been an increase in the frequency and duration of storms, as well as a marked change in the pattern of their occurrence. Hurricanes used to strike El Salvador infrequently, only came from the Atlantic and were limited to the months of September and October. However, since the mid 1990s, such storms have occurred more frequently, originated in both the Atlantic and Pacific, and have struck in six different months of the year. El Salvador lies along the Pacific Ring of Fire, and is thus subject to significant tectonic activity, including frequent earthquakes and volcanic activity. Recent examples include the earthquake on January 13, 2001 that measured 7.7 on the Richter magnitude scale and caused a landslide that killed more than 800 people; and another earthquake only a month later, on February 13, 2001, that killed 255 people and damaged about 20% of the nation's housing. Luckily, many families were able to find safety from the landslides caused by the earthquake. The San Salvador area has been hit by earthquakes in 1576, 1659, 1798, 1839, 1854, 1873, 1880, 1917, 1919, 1965, 1986, 2001 and 2005. The 5.7 Mw-earthquake of 1986 resulted in 1,500 deaths, 10,000 injuries, and 100,000 people left homeless. El Salvador's most recent destructive volcanic eruption took place on October 1, 2005, when the Santa Ana Volcano spewed a cloud of ash, hot mud and rocks that fell on nearby villages and caused two deaths. The most severe volcanic eruption in this area occurred in the 5th century AD when the Ilopango volcano erupted with a VEI strength of 6, producing widespread pyroclastic flows and devastating Mayan cities. The Santa Ana Volcano in El Salvador is active; the most recent eruptions were in 1904 and 2005. Lago de Coatepeque (one of El Salvador's lakes) was created by water filling the caldera that formed after a massive eruption. The British Imperial College's El Salvador Project aims to build earthquake-proof buildings in remote areas of the country. The torogoz is El Salvador's national bird. There are eight species of sea turtles in the world; six of them nest on the coasts of Central America, and four make their home on the Salvadoran coast: the leatherback turtle (Dermochelys coriacea), the hawksbill (Eretmochelys imbricata), the green sea turtle (black) (Chelonia agasizzii) and the olive ridley (Lepidochelys olivacea). Of these four species, the most common is the olive ridley turtle, followed by the green sea turtle. The other two species, hawksbill and leatherback, are much more difficult to find as they are critically endangered, while the olive ridley and green sea turtle are in danger of extinction. Recent conservation efforts provide hope for the future of the country's biological diversity. In 1997, the government established the Ministry of the Environment and Natural Resources. A general environmental framework law was approved by the National Assembly in 1999. Specific legislation to protect wildlife is still pending.[when?] In addition, a number of non-governmental organizations are doing important work to safeguard some of the country's most important forested areas. Foremost among these is SalvaNatura, which manages El Impossible, the country's largest national park under an agreement with El Salvador's environmental authorities. Despite these efforts, much remains to be done. It is estimated that there are 500 species of birds, 1,000 species of butterflies, 400 species of orchids, 800 species of trees, and 800 species of marine fish in El Salvador. The Executive Branch, headed by the President of the Republic, who is elected by direct vote and remains in office for five years. He can be elected to only one term. The president has a Cabinet of Ministers whom he appoints, and is also the Commander-in-Chief of the Armed Forces. The Legislative Branch, called El Salvador's Legislative Assembly (unicameral), consisting of 84 deputies. The Judiciary, headed by the Supreme Court, which is composed of 15 judges, one of them being elected as President of the Judiciary. After the Civil War, the Chapultepec Peace Accords (1992) created the new National Civil Police, the Attorney for the Defense of Human Rights and the Supreme Electoral Tribunal. The Peace Accords re-imagined the Frente Farabundo Martí para la Liberación Nacional (FMLN) as a political party and redefined the role of the army to be for the defense of the sovereignty and territorial integrity. The Accords also removed some security forces who were in command of the army, such as the National Guard, Treasury Police and special battalions that were formed to fight against the insurgency of the 1980s. The political framework of El Salvador is a presidential representative democratic republic with a multiform, multi-party system. The President, currently Salvador Sánchez Cerén, is both head of state and head of government. Executive power is exercised by the government. Legislative power is vested in both the government and the Legislative Assembly. The country also has an independent Judiciary and Supreme Court. El Salvador has a multi-party system. Two political parties, the Nationalist Republican Alliance (ARENA) and the Farabundo Martí National Liberation Front (FMLN) have tended to dominate elections. ARENA candidates won four consecutive presidential elections until the election of Mauricio Funes of the FMLN in March 2009. The FMLN Party is Leftist in ideology, and is split between the dominant Marxist-Leninist faction in the legislature, and the social liberal wing led by President Funes. Geographically, the departments of the Central region, especially the capital and the coastal regions, known as departamentos rojos, or red departments, are relatively Leftist. The departamentos azules, or blue departments in the east, western and highland regions are relatively conservative. The winner of the 2014 presidential election, Salvador Sánchez Cerén belongs to the FMLN party. In the 2015 elections for mayors and members of the National Assembly, ARENA appeared to be the winner with tight control of the National Assembly. In November, 1950 El Salvador helped the newly empowered 14th Dalai Lama by supporting his Tibetan Government cabinet minister's telegram requesting an appeal before the General Assembly of the United Nations to stop the Communist China's People's Liberation Army's invasion of Tibet. "Only the tiny country of El Salvador agreed to sponsor Tibet's plea. ""At the UN, no one was willing to stand up beside El Salvador. The other nations had overriding self-interests, which made it impossible for them to support San Salvador's attempt to bring the invasion before the General Assembly." With no other countries in support, "the UN unanimously dropped the Tibetan plea from its agenda." El Salvador is a member of the United Nations and several of its specialized agencies, the Organization of American States (OAS), the Central American Common Market (CACM), the Central American Parliament (PARLACEN), and the Central American Integration System (SICA). It actively participates in the Central American Security Commission (CASC), which seeks to promote regional arms control. El Salvador also is a member of the World Trade Organization and is pursuing regional free trade agreements. An active participant in the Summit of the Americas process, El Salvador chairs a working group on market access under the Free Trade Area of the Americas initiative. El Salvador has an army, airforce and modest navy. There are around 17,000 personnel in the armed forces in total. Amnesty International has drawn attention to several arrests of police officers for unlawful police killings. Other current issues to gain Amnesty International's attention in the past 10 years include missing children, failure of law enforcement to properly investigate and prosecute crimes against women, and rendering organized labor illegal. El Salvador is divided into 14 departments (departamentos), which in turn are subdivided into 262 municipalities (municipios). Note: Departmental capitals are in parentheses. El Salvador's economy has been hampered at times by natural disasters such as earthquakes and hurricanes, by government policies that mandate large economic subsidies, and by official corruption. Subsidies became such a problem that in April 2012, the International Monetary Fund suspended a $750 million loan to the central government. President Funes' chief of cabinet, Alex Segovia, acknowledged that the economy was at the "point of collapse." Antiguo Cuscatlán has the highest per capita income of all the cities in the country, and is a center of international investment. The GDP grew after 1996 at an annual rate that averaged 3.2% real growth. The government committed to free market initiatives, and the 2007 GDP's real growth rate was 4.7%. In December 1999, net international reserves equaled US$1.8 billion or roughly five months of imports. Having this hard currency buffer to work with, the Salvadoran government undertook a monetary integration plan beginning January 1, 2001 by which the U.S. dollar became legal tender alongside the Salvadoran colón, and all formal accounting was done in U.S. dollars. Thus, the government has formally limited the implementing of open market monetary policies to influence short-term variables in the economy. As of September 2007, net international reserves stood at $2.42 billion. It has long been a challenge in El Salvador to develop new growth sectors for a more diversified economy. In the past, the country produced gold and silver, but recent attempts to reopen the mining sector, which were expected to add hundreds of millions of dollars to the local economy, collapsed after President Saca shut down the operations of Pacific Rim Mining Corporation. Nevertheless, according to the Central American Institute for Fiscal Studies (Instituto Centroamericano for Estudios Fiscales, by its acronym in Spanish), the contribution of metallic mining was a minuscule 0.3% of the country's GDP between 2010 and 2015. Saca's decision although not lacking political motives, had strong support from local residents and grassroots movements in the country. According to NACLA, incoming President Funes later rejected a company's application for a further permit based on the risk of cyanide contamination on one of the country's main rivers. As with other former colonies, El Salvador was considered a mono-export economy (an economy that depended heavily on one type of export) for many years. During colonial times, El Salvador was a thriving exporter of indigo, but after the invention of synthetic dyes in the 19th century, the newly created modern state turned to coffee as the main export. San Miguel is an important economic center of El Salvador and home to the "Carnival of San Miguel", one of the biggest festivals of entertainment and food in Central America. The government has sought to improve the collection of its current revenues, with a focus on indirect taxes. A 10% value-added tax (IVA in Spanish), implemented in September 1992, was raised to 13% in July 1995. Inflation has been steady and among the lowest in the region. Since 1997 inflation has averaged 3%, with recent years increasing to nearly 5%. As a result of the free trade agreements, from 2000 to 2006, total exports have grown 19% from $2.94 billion to $3.51 billion, and total imports have risen 54% from $4.95 billion to $7.63 billion. This has resulted in a 102% increase in the trade deficit, from $2.01 billion to $4.12 billion. 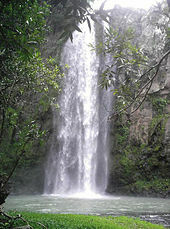 El Chorreron, El Salvador; tourism is the fastest-growing sector of the Salvadoran economy. El Salvador has promoted an open trade and investment environment, and has embarked on a wave of privatization extending to telecommunications, electricity distribution, banking, and pension funds. In late 2006, the government and the Millennium Challenge Corporation signed a five-year, $461 million compact to stimulate economic growth and reduce poverty in the country's northern region, the primary conflict zone during the civil war, through investments in education, public services, enterprise development, and transportation infrastructure. With the adoption of the US dollar as its currency in 2001, El Salvador lost control over monetary policy. Any counter-cyclical policy response to the downturn must be through fiscal policy, which is constrained by legislative requirements for a two-thirds majority to approve any international financing. El Salvador leads the region in remittances per capita, with inflows equivalent to nearly all export income; about a third of all households receive these financial inflows. Remittances from Salvadorans living and working in the United States, sent to family members in El Salvador, are a major source of foreign income and offset the substantial trade deficit of $4.12 billion. Remittances have increased steadily in the last decade, and reached an all-time high of $3.32 billion in 2006 (an increase of 17% over the previous year). approximately 16.2% of gross domestic product(GDP). Remittances have had positive and negative effects on El Salvador. In 2005, the number of people living in extreme poverty in El Salvador was 20%, according to a United Nations Development Program report. Without remittances, the number of Salvadorans living in extreme poverty would rise to 37%. While Salvadoran education levels have gone up, wage expectations have risen faster than either skills or productivity. For example, some Salvadorans are no longer willing to take jobs that pay them less than what they receive monthly from family members abroad. This has led to an influx of Hondurans and Nicaraguans who are willing to work for the prevailing wage. Also, the local propensity for consumption over investment has increased. Money from remittances has also increased prices for certain commodities such as real estate. With much higher wages, many Salvadorans abroad can afford higher prices for houses in El Salvador than local Salvadorans, and thus push up the prices that all Salvadorans must pay. In 2006, El Salvador was the first country to ratify the Central America-Dominican Republic Free Trade Agreement. CAFTA has bolstered exports of processed foods, sugar, and ethanol, and supported investment in the apparel sector, which faced Asian competition with the expiration of the Multi-Fiber Agreement in 2005. In anticipation of the declines in the apparel sector's competitiveness, the previous administration sought to diversify the economy by promoting the country as a regional distribution and logistics hub, and by promoting tourism investment through tax incentives. There are a total of 15 free trade zones in El Salvador. El Salvador signed the Central American Free Trade Agreement (CAFTA) — negotiated by the five countries of Central America and the Dominican Republic — with the United States in 2004. CAFTA requires that the Salvadoran government adopt policies that foster free trade. El Salvador has signed free trade agreements with Mexico, Chile, the Dominican Republic, and Panama and increased its trade with those countries. El Salvador, Guatemala, Honduras, and Nicaragua also are negotiating a free trade agreement with Canada. In October 2007, these four countries and Costa Rica began free trade agreement negotiations with the European Union. Negotiations started in 2006 for a free trade agreement with Colombia. In an analysis of ARENA's electoral defeat in 2009, the U.S. Embassy in San Salvador pointed to official corruption under the Saca administration as a significant reason for public rejection of continued ARENA government. According to a secret diplomatic cable made public by WikiLeaks, "While the Salvadoran public may be inured to self-serving behavior by politicians, many in ARENA believe that the brazen manner in which Saca and his people are widely perceived to have used their positions for personal enrichment went beyond the pale. ARENA deputy Roberto d'Aubuisson, son of ARENA founder Roberto d'Aubuisson, told [a U.S. diplomat] that Saca 'deliberately ignored' his Public Works Minister's government contract kickbacks scheme, even after the case was revealed in the press. Furthermore, considerable evidence exists, including from U.S. business sources, that the Saca administration pushed laws and selectively enforced regulations with the specific intent to benefit Saca family business interests." Subsequent policies under Funes administrations improved El Salvador to foreign investment, and the World Bank in 2014 rated El Salvador 109, a little better than Belize (118) and Nicaragua (119) in the World Bank's annual "Ease of doing business" index. As per Santander Trade, a Spanish think tank in foreign investment, "Foreign investment into El Salvador has been steadily growing during the last few years. In 2013, the influx of FDI increased. Nevertheless, El Salvador receives less FDI than other countries of Central America. The government has made little progress in terms of improving the business climate. In addition to this, the limited size of its domestic market, weak infrastructures and institutions, as well as the high level of criminality have been real obstacles to investors. However, El Salvador is the second most "business friendly" country in South America in terms of business taxation. It also has a young and skilled labor force and a strategic geographical position. The country's membership in the DR-CAFTA, as well as its reinforced integration to the C4 countries (producers of cotton) should lead to an increase of FDI." Foreign companies have lately resorted to arbitration in international trade tribunals in total disagreement with Salvadoran government policies. In 2008, El Salvador sought international arbitration against Italy's Enel Green Power, on behalf of Salvadoran state-owned electric companies for a geothermal project Enel had invested in. Four years later, Enel indicated it would seek arbitration against El Salvador, blaming the government for technical problems that prevent it from completing its investment. The government came to its defense claiming that Art 109 of the constitution does not allow any government (regardless of the party they belong), to privatize the resources of the national soil (in this case geothermic energy). The dispute came to an end in December 2014 when both parties came to a settlement, from which no details have been released. The small country had yielded to pressure from the Washington based powerful ICSID. The U.S. Embassy warned in 2009 that the Salvadoran government's populist policies of mandating artificially low electricity prices were damaging private sector profitability, including the interests of American investors in the energy sector. The U.S. Embassy noted the corruption of El Salvador's judicial system and quietly urged American businesses to include "arbitration clauses, preferably with a foreign venue," when doing business in the country. The U.S. Embassy warned in 2009 that the Salvadoran government's populist policies of mandating artificially low electricity prices were damaging private sector profitability, including the interests of American investors in the energy sector. The U.S. Embassy noted the corruption of El Salvador's judicial system and quietly urged American businesses to include "arbitration clauses, preferably with a foreign venue," when doing business in the country. On the other hand, a 2008 report by the United Nations Conference on Trade and Development  indicates that one third of the generation of electricity in El Salvador was publicly owned while two thirds was in American hands and other foreign ownership. It is only natural for a small, under-developed country like El Salvador to subsidize some of the resources for the vast majority of its poor population. Although some events may have tarnished the image of the El Salvadoran government, not everything is bad news. In terms of how people perceived the levels of public corruption in 2014, El Salvador ranks 80 out of 175 countries as per the Corruption Perception Index. El Salvador's rating compares relatively well with Panama (94 of 175) and Costa Rica (47 of 175). It was estimated that 1,394,000 international tourists would visit El Salvador in 2014. Tourism contributed US$855.5 million to El Salvador's GDP in 2013. This represented 3.5% of total GDP. Tourism directly supported 80,500 jobs in 2013. This represented 3.1% of total employment in El Salvador. In 2013, tourism indirectly supported 210,000 jobs, representing 8.1% of total employment in El Salvador. The airport serving international flights in El Salvador is Monseñor Óscar Arnulfo Romero International Airport. This airport is located about 40 km (25 mi) southeast of San Salvador. El Salvador has surf tourism due to large waves from the Pacific Ocean. Most North American and European tourists seek out El Salvador's beaches and nightlife. Besides these two attractions, El Salvador's tourism landscape is slightly different from those of other Central American countries. Because of its geographic size and urbanization there are not many nature-themed tourist destinations such as ecotours or archaeological sites open to the public. Surfing is a natural tourism sector that has gained popularity in recent years as Salvadoran beaches have become increasingly popular. Surfers visit many beaches on the coast of La Libertad and the east end of El Salvador, finding surfing spots that are not yet overcrowded. The use of the United States dollar as Salvadoran currency and direct flights of 4 to 6 hours from most cities in the United States are factors that attract American tourists. Urbanization and Americanization of Salvadoran culture has also led to the abundance of American-style malls, stores, and restaurants in the three main urban areas, especially greater San Salvador. According to the El Salvadoran newspaper El Diario De Hoy, the top 10 attractions are: the coastal beaches, La Libertad, Ruta Las Flores, Suchitoto, Playa Las Flores in San Miguel, La Palma, Santa Ana (location of the country's highest volcano), Nahuizalco, Apaneca, Juayua, and San Ignacio. The level of access to water supply and sanitation has been increased significantly. A 2015 conducted study by the University of North Carolina called El Salvador the country that has achieved the greatest progress in the world in terms of increased access to water supply and sanitation and the reduction of inequity in access between urban and rural areas. However, water resources are seriously polluted and a large part of the wastewater discharged into the environment without any treatment. Institutionally a single public institution is both de facto in charge of setting sector policy and of being the main service provider. Attempts at reforming and modernizing the sector through new laws have not borne fruit over the past 20 years. El Salvador's population was 6,344,722 in 2016, compared to 2,200,000 in 1950. In 2010 the percentage of the population below the age of 15 was 32.1%, 61% were between 15 and 65 years of age, while 6.9% were 65 years or older. The capital city of San Salvador has a population of about 2.1 million people. An estimated 42% of El Salvador's population live in rural areas. Urbanization has expanded at a phenomenal rate in El Salvador since the 1960s, with millions moving to the cities and creating associated problems for urban planning and services. There are up to 100,000 Nicaraguans living in El Salvador. Salvadoran model Irma Dimas was crowned Miss El Salvador in 2005. She made headlines recently for her entry into Salvadoran politics. El Salvador's population is composed of Mestizos, whites, and indigenous peoples. Eighty-six percent of Salvadorans are of mestizo ancestry, having mixed indigenous and European ancestry. In the mestizo population, Salvadorans who are racially European, especially Mediterranean, as well as Afro-Salvadoran, and the indigenous people in El Salvador who do not speak indigenous languages or have an indigenous culture, all identify themselves as being culturally mestizo. 12.7% of Salvadorans are white. A majority of Central European immigrants in El Salvador arrived during World War II as refugees from the Czech Republic, Germany, Hungary, Poland, and Switzerland. There are also a small community of Jews, Palestinian Christians, and Arab Muslims (in particular Palestinians). 0.23% of the population are of full indigenous origin, the ethnic groups are Kakawira which represents 0.07% of the total country's population, then (Pipil) 0.06%, (Lenca) 0.04% and others minors groups 0.06%. 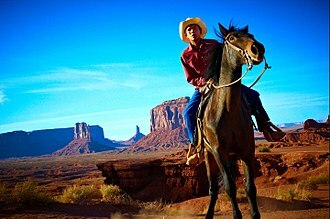 Very few Amerindians have retained their customs and traditions, having over time assimilated into the dominant Mestizo/Spanish culture. 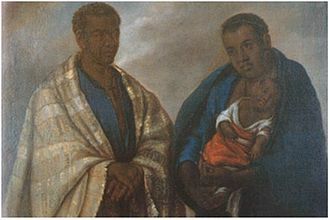 There is a small Afro-Salvadoran that is 0.13% of the total population, with Blacks having traditionally been prevented from immigrating via government policies. Among the immigrant groups in El Salvador, Palestinian Christians stand out. Though few in number, their descendants have attained great economic and political power in the country, as evidenced by the election of ex-president Antonio Saca, whose opponent in the 2004 election, Schafik Handal, was also of Palestinian descent, and the flourishing commercial, industrial, and construction firms owned by this ethnic group. As of 2004[update], there were approximately 3.2 million Salvadorans living outside El Salvador, with the United States traditionally being the destination of choice for Salvadoran economic migrants. By 2012, there were about 2.0 million Salvadoran immigrants and Americans of Salvadoran descent in the U.S., making them the sixth largest immigrant group in the country. The second destinatation of Salvadorans living outside is Guatemala, with more than 111,000 persons, mainly in Guatemala City. Salvadorans also live in other nearby countries such as Belize, Honduras and Nicaragua. Other countries with notable Salvadoran communities include Canada, Mexico, the United Kingdom (including the Cayman Islands), Sweden, Brazil, Italy, Colombia, and Australia. Spanish is the official language and is spoken by virtually all inhabitants. Some indigenous people speak their native tongues (such as Nawat and Maya), but indigenous Salvadorans who do not identify as mestizo constitute only 1% of the country's population. However, all of them can speak Spanish. Q'eqchi' is spoken by immigrants of Guatemalan and Belizean indigenous people living in El Salvador. There have also been recent large migrations of Hondurans and Nicaraguans into the country. The local Spanish vernacular is called Caliche. Salvadorans use voseo, which is also used in Argentina, Costa Rica, Nicaragua and Uruguay. This refers to the use of "vos" as the second person pronoun, instead of "tú". "Caliche" is considered informal, and a few people choose not to use it. Nawat is an indigenous language that has survived, though it is only used by small communities of some elderly Salvadorans in western El Salvador. The majority of the population in El Salvador is Christian. Roman Catholics (47%) and Protestants (33%) are the two major religious groups in the country, with the Catholic Church the largest denomination. Those not affiliated with any religious group amount to 17% of the population. 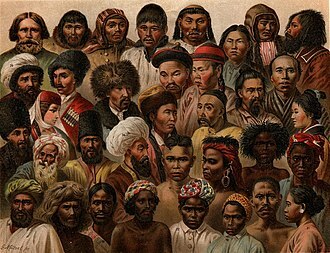 The remainder of the population (3%) is made up of Jehovah's Witnesses, Hare Krishnas, Muslims, Jews, Buddhists, Latter-day Saints, and those adhering to indigenous religious beliefs. The number of evangelicals in the country is growing rapidly. Oscar Romero, the first El Salvadoran saint, was canonized by Pope Francis on 14 October 2018. The public education system in El Salvador is severely lacking in resources. Class sizes in public schools can be as large as 50 children per classroom. Salvadorans who can afford the cost often choose to send their children to private schools, which are regarded as being better-quality than public schools. Most private schools follow American, European or other advanced systems. Lower-income families are forced to rely on public education. Education in El Salvador is free through high school. After nine years of basic education (elementary–middle school), students have the option of a two-year high school or a three-year high school. A two-year high school prepares the student for transfer to a university. A three-year high school allows the student to graduate and enter the workforce in a vocational career, or to transfer to a university to further their education in their chosen field. Universities in El Salvador include a central public institution, the Universidad de El Salvador, and many other specialised private universities. Since the early twenty-first century, El Salvador has experienced high crime rates, including gang-related crimes and juvenile delinquency. El Salvador has the highest murder rate in the world. It is also considered an epicenter of a gang crisis, along with Guatemala and Honduras. In response to this, the government has set up countless programs to try to guide the youth away from gang membership; so far its efforts have not produced any quick results. One of the government programs was a gang reform called "Super Mano Dura" (Super Firm Hand). Super Mano Dura had little success and was highly criticized by the UN. It saw temporary success in 2004 but then saw a rise in crime after 2005. In 2004, the rate of intentional homicides per 100,000 citizens was 41, with 60% of the homicides committed being gang-related. The Salvadoran government reported that the Super Mano Dura gang legislation led to a 14% drop in murders in 2004. However, El Salvador had 66 homicides per 100,000 inhabitants in 2012, more than triple the rate in Mexico that year. There are an estimated 25,000 gang members at large in El Salvador with another 9,000 in prison. The most well-known gangs, called "maras" in colloquial Spanish, are Mara Salvatrucha and their rivals Barrio 18. Maras are hunted by death squads including Sombra Negra. New rivals also include the rising mara, The Rebels 13. As of March 2012[update], El Salvador has seen a 40% drop in crime due to what the Salvadoran government called a gang truce; however, extortions affecting small businesses are not taken into account. In early 2012, there were on average of 16 killings per day; in late March of that year that number dropped to fewer than 5 per day. On April 14, 2012 for the first time in over 3 years there were no killings in El Salvador. Overall, there were 411 killings in January 2012, and in March the number was 188, more than a 40% reduction, while crime in neighboring Honduras had risen to an all-time high. In 2014, crime rose 56% in El Salvador, with the government attributing the rise to a break in the truce between the two major gangs in El Salvador, which began having turf wars. Presently, the Alto al Crimen or Crime Stoppers program is in operation and provides financial rewards for information leading to the capture of gang leadership. The reward often ranges between US$100 and $500 per call. The iconic statue of Christ on the globe sphere of planet earth is part of the Monumento al Divino Salvador del Mundo (Monument to the Divine Savior of the world) on Plaza El Salvador del Mundo (The Savior of the World Plaza), a landmark located in the country's capital, San Salvador. Mestizo culture dominates the country, heavy in both Native American Indigenous and European Spanish influences. A new composite population was formed as a result of intermarrying between the native Mesoamerican population of Cuzcatlan with the European settlers. The Catholic Church plays an important role in the Salvadoran culture. Archbishop Óscar Romero is a national hero for his role in resisting human rights violations that were occurring in the lead-up to the Salvadoran Civil War. Significant foreign personalities in El Salvador were the Jesuit priests and professors Ignacio Ellacuría, Ignacio Martín-Baró, and Segundo Montes, who were murdered in 1989 by the Salvadoran Army during the height of the civil war. Painting, ceramics and textiles are the principal manual artistic mediums. Writers Francisco Gavidia (1863–1955), Salarrué (Salvador Salazar Arrué) (1899–1975), Claudia Lars, Alfredo Espino, Pedro Geoffroy Rivas, Manlio Argueta, José Roberto Cea, and poet Roque Dalton are among the most important writers from El Salvador. Notable 20th-century personages include the late filmmaker Baltasar Polio, female film director Patricia Chica, artist Fernando Llort, and caricaturist Toño Salazar. Amongst the more renowned representatives of the graphic arts are the painters Augusto Crespin, Noe Canjura, Carlos Cañas, Giovanni Gil, Julia Díaz, Mauricio Mejia, Maria Elena Palomo de Mejia, Camilo Minero, Ricardo Carbonell, Roberto Huezo, Miguel Angel Cerna, (the painter and writer better known as MACLo), Esael Araujo, and many others. 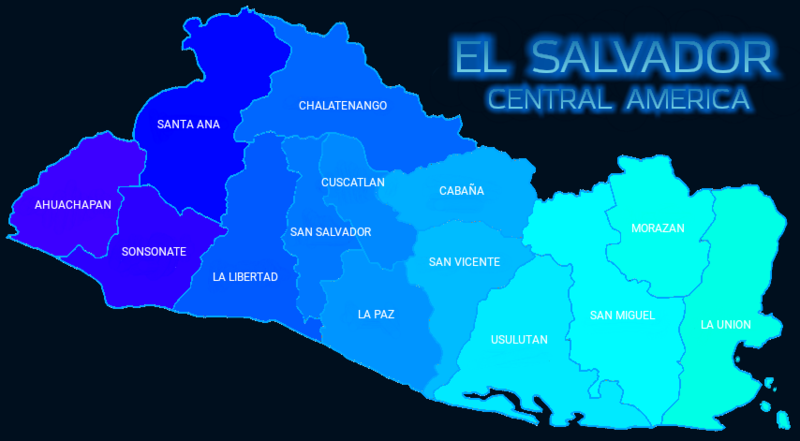 For more information on prominent citizens of El Salvador, check the List of Salvadorans. March/April Holy Week/Easter Semana Santa Celebrated with Carnival-like events in different cities by the large Catholic population. May 3 The Day of the Cross Día de la Cruz A celebration with precolonial origins, linked to the advent of the rainy season. People decorate a cross in their yards with fruit and garlands, in the belief that if they do not, the devil will appear and dance at their yard. They then go from house to house to kneel in front of the altar and make the sign of the cross. May 7 Soldiers' Day Día del Soldado Marks the founding of its armed forces in 1824. May 10 Mother's Day Día de las Madres A day to celebrate motherhood, similar to many other countries Mother's Day. June 17 Father's Day Día del Padre A day to celebrate fatherhood, similar to other countries Father's Day. August 1–7 August Festivals Fiestas de agosto Week-long festival in celebration of El Salvador del Mundo, patron saint of San Salvador. September 15 Independence Day Día de la Independencia Celebrates independence from Spain, achieved in 1821. October 1 Children's Day "Día del niño" Celebration dedicated to the Children of the country, celebrated across the country. October 12 Ethnic Pride Day Día de la raza Celebration dedicated to Christopher Columbus' arrival in America. November 7–13 National Pupusa Festival Festival Nacional De La Pupusa This week is the national commemoration of the national food (Pupusa). November 21 Day of the Queen of Peace Dia de la Reina de la Paz Day of the Queen of Peace, the patron saint. Also celebrated, the San Miguel Carnival, (carnaval de San Miguel), celebrated in San Miguel City, similar to Mardi Gras of New Orleans, where one can enjoy about 45 music bands on the street. December 25 Christmas Day (Celebrated Dec. 24th) Noche Buena In many communities, December 24 (Christmas Eve) is the major day of celebration, often to the point that it is considered the actual day of Navidad — with December 25 serving as a day of rest. December 31 New Year's Eve Fin de año The final day of the Gregorian year, and the day before New Year's Day is celebrated in El Salvador with family reunions. Pupusas, the national and most famous dish of El Salvador. One of El Salvador's notable dishes is the pupusa. Pupusas are handmade corn tortillas (made of masa de maíz or masa de arroz, a maize or rice flour dough used in Latin American cuisine) stuffed with one or more of the following: cheese (usually a soft Salvadoran cheese such as quesillo, similar to mozzarella), chicharrón, or refried beans. Sometimes the filling is queso con loroco (cheese combined with loroco, a vine flower bud native to Central America). Pupusas revueltas are pupusas filled with beans, cheese and pork. There are also vegetarian options. Some adventurous restaurants even offer pupusas stuffed with shrimp or spinach. The name pupusa comes from the Pipil-Nahuatl word, pupushahua. The precise origins of the pupusa are debated, although its presence in El Salvador is known to predate the arrival of the Spaniards. Two other typical Salvadoran dishes are yuca frita and panes con pollo. Yuca frita is deep fried cassava root served with curtido (a pickled cabbage, onion and carrot topping) and pork rinds with pescaditas (fried baby sardines). The Yuca is sometimes served boiled instead of fried. Pan con pollo/pavo (bread with chicken/turkey) are warm turkey or chicken-filled submarine sandwiches. The bird is marinated and then roasted with Pipil spices and handpulled. This sandwich is traditionally served with tomato and watercress along with cucumber, onion, lettuce, mayonnaise, and mustard. One of El Salvador's typical breakfasts is fried plantain, usually served with cream. 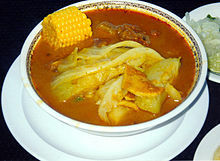 It is common in Salvadoran restaurants and homes, including those of immigrants to the United States. Alguashte, a condiment made from dried, ground pepitas, is commonly incorporated into savoury and sweet Salvadoran dishes. "Maria Luisa" is a dessert commonly found in El Salvador. It is a layered cake that is soaked in orange marmalade and sprinkled with powdered sugar. A popular drink that Salvadorans enjoy is Horchata, a drink native to the Valencian Community in Spain. Horchata is most commonly made of the morro seed ground into a powder and added to milk or water, and sugar. Horchata is drank year-round, and can be drank at any time of day. It mostly is accompanied by a plate of pupusas or fried yuca. Horchata from El Salvador has a very distinct taste and is not to be confused with Mexican horchata, which is rice-based. Coffee is also a common morning beverage. Other popular drinks in El Salvador include Ensalada, a drink made of chopped fruit swimming in fruit juice, and Kolachampan, a sugar cane-flavored carbonated beverage. One of the most popular desserts is the cake Pastel de tres leches (Cake of three milks), consisting of three types of milk: evaporated milk, condensed milk, and cream. Salvadoran music is a mixture of indigenous Lenca, Maya, Cacaopera, Pipil and Spanish influences. Music includes religious songs (mostly used to celebrate Christmas and other holidays, especially feast days of the saints). Satirical and rural lyrical themes are common. Cuban, Colombian, and Mexican music has infiltrated the country, especially salsa and cumbia. Popular music in El Salvador uses marimba, tehpe'ch, flutes, drums, scrapers and gourds, as well as more recently imported guitars and other instruments. El Salvador's well known folk dance is known as Xuc which originated in Cojutepeque, Cuscatlan. Other musical repertoire consists of danza, pasillo, marcha and canciones. Football is the most popular sport in El Salvador. The El Salvador national football team qualified for the FIFA World Cup in 1970 and 1982. Their qualification for the 1970 tournament was marred by the Football War, a war against Honduras, whose team El Salvador's had defeated. The national football team play at the Estadio Cuscatlán in San Salvador. It opened in 1976 and seats 53,400, making it the largest stadium in Central America and the Caribbean. ^ "CIA The World Factbook: People and Society – El Salavador". ^ David Scott FitzGerald (22 April 2014). Culling the Masses. Harvard University Press. p. 363. ISBN 978-0-674-36967-2. ^ a b c d "World Population Prospects: The 2017 Revision". ESA.UN.org (custom data acquired via website). United Nations Department of Economic and Social Affairs, Population Division. Retrieved 10 September 2017. ^ Roy Boland (1 January 2001). Culture and Customs of El Salvador. Greenwood Publishing Group. p. 2. ISBN 978-0-313-30620-4. ^ Maureen Ihrie; Salvador Oropesa (20 October 2011). World Literature in Spanish: An Encyclopedia [3 volumes]: An Encyclopedia. ABC-CLIO. p. 332. ISBN 978-0-313-08083-8. ^ Jeanne M. Haskin (2012). From Conflict to Crisis: The Danger of U.S. Actions. Algora Publishing. p. 152. ISBN 978-0-87586-961-2. ^ Tommie Sue Montgomery (1995). Revolution in El Salvador: From Civil Strife to Civil Peace. Westview Press. p. 27. ISBN 978-0-8133-0071-9. ^ Kevin Murray (1 January 1997). El Salvador: Peace on Trial. Oxfam. pp. 8–. ISBN 978-0-85598-361-1. ^ Roy Boland (1 January 2001). Culture and Customs of El Salvador. Greenwood Publishing Group. p. 8. ISBN 978-0-313-30620-4. ^ Thomas L. Pearcy (2006). The History of Central America. Greenwood Publishing Group. p. 43. ISBN 978-0-313-32293-8. ^ Erin Foley; Rafiz Hapipi (2005). El Salvador. Marshall Cavendish. p. 43. ISBN 978-0-7614-1967-9. ^ Jeni Klugman (2010). 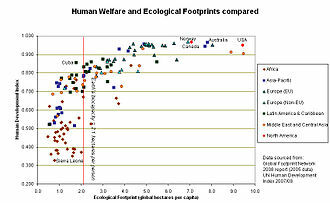 "Human Development Report 2010" (Report). Palgrave Macmillan. p. 152. Retrieved 18 October 2013. ^ a b Lyle Campbell (1985). The Pipil Language of El Salvador. Walter de Gruyter. pp. 924–925. ISBN 978-0-89925-040-3. ^ William R. Fowler, Jr. (6 August 1991). The Formation of Complex Society in Southeastern Mesoamerica. CRC Press. p. 8. ISBN 978-0-8493-8831-6. ^ Juan Luna Cárdenas (1950). Tratado de etimologías de la lengua aztekatl: para uso de profesores y estudiantes de historias de América y de México, de ciencias naturales y ciencias sociales de las escuela secundarias, normales y preparatorias. U. Tl. I. Aztekatl. p. 27. ^ María de Baratta (1951). Cuzcatlán típico: ensayo sobre etnofonía de El Savator, folklore, folkwisa y folkway. Ministerio de Cultura. p. 15. ^ Juan Luna Cárdenas (1964). Aztequismos en el español de México. Secretaría de Educación Pública. p. 47. ^ Lyle Campbell. American Indian Languages. Oxford University Press. p. 167. ISBN 978-0-19-534983-2. ^ Catherine M. Tucker (2008). Changing Forests: Collective Action, Common Property, and Coffee in Honduras. Springer. p. 20. ISBN 978-1-4020-6977-2. ^ Thompson, John Eric Sidney (1990). Maya History and Religion, pp. 84–102. ^ Stephanie True Peters (2005). Smallpox in the New World. Marshall Cavendish. pp. 13–18. ISBN 978-0-7614-1637-1. ^ Jeb J. Card (2007). The Ceramics of Colonial Ciudad Vieja, El Salvador: Culture Contact and Social Change in Mesoamerica. ProQuest. p. 99. ISBN 978-0-549-26142-1. ^ Explorer's Guide El Salvador: A Great Destination. Countryman Press. 4 October 2010. p. 36. ISBN 978-1-58157-114-1. ^ Gonzalo Fernández de Oviedo y Valdés (28 August 2006). Writing from the edge of the world: the memoirs of Darién, 1514–1527. University of Alabama Press. p. 164. ISBN 978-0-8173-1518-4. ^ Deborah L. Nichols; Christopher A. Pool (18 October 2012). The Oxford Handbook of Mesoamerican Archaeology. Oxford University Press. p. 94. ISBN 978-0-19-539093-3. ^ Minority Rights Group International. "World Directory of Minorities" (PDF). Retrieved June 3, 2016. ^ Thomas P. Anderson (1988). Politics in Central America: Guatemala, El Salvador, Honduras, and Nicaragua. Greenwood Publishing Group. ISBN 978-0-275-92883-4. Retrieved 29 July 2012 – via Google Books. ^ Thomas P. Anderson (1992). Matanza: The 1932 "Slaughter" That Traumatized a Nation, Shaping Us-Salvadoran Policy to This Day. Curbstone Press. ISBN 978-1-880684-04-7. Retrieved 29 July 2012. ^ "El Salvador – Demographics". Library of Congress Country Studies. ^ "El Salvador – Migration". Library of Congress Country Studies. ^ "El Salvador Supreme Court disbands two parties". BBC News. 2011-04-30. Retrieved 2014-07-02. ^ "Chronology" Archived 2016-03-26 at the Wayback Machine. Chronology of the Salvadoran Civil War, Kellogg Institute, University of Notre Dame. Retrieved 2008-01-17. ^ Mason, T.D. ; D.A. Krane (1989). "The Political Economy of Death Squads: Toward a Theory of the Impact of State-Sanctioned Terror". International Studies Quarterly. 33 (2): 175–198. doi:10.2307/2600536. ^ Notorious Salvadoran Battalion Is Disbanded : Military: U.S.-trained Atlacatl unit was famed for battle prowess but was also implicated in atrocities. Los Angeles Times. 9 December 1992. ^ "El Salvador Country Brief". World Bank. 2008. ^ "Funes saca a luz corrupción en gobiernos de ARENA" (in Spanish). Diario CoLatino. 2009. Archived from the original on 2014-07-06. ^ United States Embassy San Salvador, "ARENA Expels Former President Saca," classified diplomatic cable, December 15, 2009, released by WikiLeaks, Cable ID 09SANSALVADOR1103 Archived 2013-01-16 at the Wayback Machine. ^ "Photo Essay: El Salvador, the Makings of a Gangland". Pbs.org. 2006-07-11. Retrieved 2010-05-02. ^ "El Salvador" (PDF). Fiu.edu. Archived from the original (PDF) on 2007-07-02. Retrieved 2010-05-02. ^ a b c "El Salvador landslide". Travel.state.gov. Archived from the original on 2010-05-10. Retrieved 2010-05-02. ^ Winds of change for facing climate change in El Salvador: Foundations for a National Strategy, 2012. ^ Lomnitz, Cinna; Schultz, Rudolf (1966). "The San Salvador earthquake of May 3, 1965". Bulletin of the Seismological Society of America. 56 (2): 561–575. ^ Harlow, David H. (1993). "The San Salvador earthquake of 10 October 1986 and its historical context". Bulletin of the Seismological Society of America. 83 (4): 1143–1154. ^ Bommer, Julian; Ledbetter, Stephen (1987). "The San Salvador earthquake of 10th October 1986". Disasters. 11 (2): 83–95. doi:10.1111/j.1467-7717.1987.tb00620.x. ^ Dull, Robert A.; Southon; Sheets (2001). "Volcanism, Ecology and Culture: A Reassessment of the Volcan Ilopango Tbj eruption in the Southern Maya Realm". Latin American Antiquity. 12 (1): 25–44. doi:10.2307/971755. ^ "How is a volcano defined as being active, dormant, or extinct?". Volcano World. Retrieved 2013-02-18. ^ a b c Laird, Thomas (2006). The Story of Tibet:Conversations with His Holiness the Dalai Lama. New York: Grove Press. pp. 303–305. ISBN 9780802118271. ^ El Salvador Human Rights Archived 2011-04-29 at the Wayback Machine. Amnesty International. Retrieved 2012-07-28. ^ FMI suspende acuerdo de préstamo con el país Archived 2012-07-02 at the Wayback Machine, La Prensa Grafica (2012-04-26). ^ "Gross Domestic Product, annual rates, main economic sectors". Banco Central de Reserva de El Salvador. Archived from the original on November 7, 2007. Retrieved 2007-11-17. ^ "Saldos a fin de año o mes" (in Spanish). Banco Central de Reserva de El Salvador. Archived from the original on October 14, 2007. Retrieved 2007-11-17. ^ "Estudio sobre minería metálica en triángulo norte se presenta en El Salvador". 7 April 2017. ^ "Pacific Rim Ruling Threatens El Salvador's National Sovereignty". NACLA. ^ Maria Herrera-Sobek (31 July 2012). Celebrating Latino Folklore. ABC-CLIO. p. 459. ISBN 978-0-313-34340-7. ^ "Trade Balance, Annual and Monthly Accumulated". Banco Central de Reserva de El Salvador. Archived from the original on October 14, 2007. Retrieved 2007-11-17. ^ "Family Remittances". Banco Central de Reserva de El Salvador. Archived from the original on November 7, 2007. Retrieved 2007-11-17. ^ "Objetivos de Desarrollo del Milenio" (in Spanish). Archived from the original on May 27, 2007. Retrieved 2007-05-23. ^ Aizenman, N.C. (2006-05-13). "Money Earned in U.S. Pushes Up Prices in El Salvador". The Washington Post. Retrieved 2010-05-02. ^ U.S. Embassy San Salvador, "Reorganizing ARENA: The party's future after Avila's defeat," secret diplomatic cable, 6 October 2009, released by WikiLeaks, ID No. 09SANSALVADOR947 Archived 2012-06-03 at the Wayback Machine. ^ "Archived copy". Archived from the original on 2015-02-06. Retrieved 2014-10-01. CS1 maint: Archived copy as title (link) Annual index, Doing Business 2014, World Bank. ^ "Foreign investment in El Salvador - Santandertrade.com". en.santandertrade.com. ^ "CEL a punto de ir a otro arbitraje," El Diario de Hoy (2012-05-21). ^ a b U.S. Embassy San Salvador, "Electricity Sector Reforms Threaten Private Sector Profitability," 14 December 2009, released by WikiLeaks, ID No. 09SANSALVADOR1184 Archived 2013-01-16 at the Wayback Machine. ^ a b U.S. Embassy San Salvador, "El Salvador: 2009 Investment Statement," diplomatic cable, 15 January 2009, released by WikiLeaks, ID No. 09SANSALVADOR47 Archived 2013-01-16 at the Wayback Machine. ^ e.V., Transparency International. "How corrupt is your country?". transparency.org. ^ ""Travel and Tourism, Economic Impact 2014 – El Salvador", World Travel and Tourism Council, 2014, p. 5" (PDF). ^ a b c ""Travel and Tourism, Economic Impact 2014 – El Salvador", World Travel and Tourism Council, 2014, p. 1" (PDF). ^ "CEPA – Aeropuerto Internacional de El Salvador". Aeropuertoelsalvador.gob.sv. Archived from the original on 2006-02-13. Retrieved 2010-05-02. ^ Milady Cruz (2007-06-24). "Los 10 destinos turísticos más apetecidos". elsalvador.com. Archived from the original on 2008-02-23. Retrieved 2010-05-02. ^ The Water Institute; University of North Carolina (eds.). "The WASH Performance Index Report". ^ "The Nicaragua case_M Orozco2 REV.doc" (PDF). Archived from the original (PDF) on 2011-05-11. Retrieved 2010-05-02. 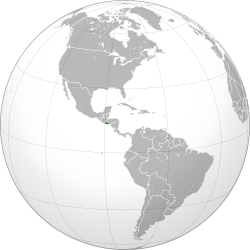 ^ "CIA – The World Factbook – El Salvador". CIA. Retrieved 2013-10-12. ^ "Jose Napoleon Duarte, Hernandez Martinez, Ungo, Matanza, Central American Common Market, CACM, urban middle class, Christian Democratic Party, powerful families, death squads, Organization of American States, PRUD, International Court Of Justice, urban center, rapid population growth". countriesquest.com. ^ Elena Salamanca (October 23, 2005). "NO a 'los otros'" (in Spanish). La Prensa Gráfica. Archived from the original on January 2, 2008. Retrieved 2007-12-29. ^ Montgomery, Tommie Sue (1995). Revolution in El Salvador: from civil strife to civil peace. Boulder, Colo: Westview Press. ISBN 0-8133-0071-1. ^ Marín-Guzmán, Roberto (2000). A Century of Palestinian Immigration into Central America: A study of their economic and cultural contributions. San Jose, CR: Universidad de Costa Rica. ^ "Comunidad Salvadorena: Republica de Nicaragua" (PDF). Ministerio de Relaciones Exteriores de El Salvador. Archived from the original (PDF) on 2009-03-03. Retrieved 2008-01-06. ^ Ethnologue report for language code:kek. 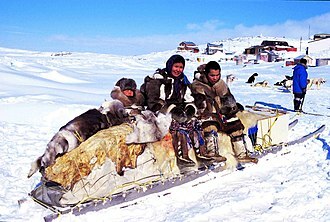 Ethnologue.com. Retrieved 2012-07-28. ^ "2007 El Salvador Bureau of Statistics estimate" (PDF). General (Salvadoran) Institute of Statistics and Census. April 2008. Retrieved 2 September 2011. ^ a b c "International Religious Freedom Report for 2012". U.S. State Department. Retrieved 2014-03-27. ^ Stephen Offutt, New Centers of Global Evangelicalism in Latin America and Africa (Cambridge University Press, 2015) focuses on El Salvador and South Africa. ^ "What's Education Like in El Salvador". web.stanford.edu. Retrieved 2018-01-29. ^ Peetz, Peter (June 2008). "Youth, Crime, and the Responses of the State: Discourses on Violence in Costa Rica, El Salvador, and Nicaragua" (PDF). GIGA Working Papers. 80. ^ a b Ribando, Clare (2005-05-10). "Gangs in Central America" (PDF). Congressional Research Service. The Library of Congress. Retrieved 2007-06-30. ^ Bresnahan, Ryann (2006-08-21). "El Salvador Dispatches Additional Contingent to Iraq:Domestic Issues Overrule Anxiety over War". Council on Hemispheric Affairs (COHA). Retrieved 2007-06-30. ^ "Workers dig near a yellow police line during an exhumation at a clandestine cemetery in Villa Madrir". Yahoo News. May 2012. Archived from the original on 2012-07-09. ^ "Número de Víctimas y Tasas de Homicidios Dolosos en El Salvador (1999–2006)" (PDF) (in Spanish). Observatorio Centroamericano sobre Violencia. Archived from the original (PDF) on 2009-03-25. Retrieved 2007-12-26. ^ El Salvador celebrates murder-free day – ABC News (Australian Broadcasting Corporation). Australian Broadcasting Corporation.au (2012-04-16). Retrieved 2012-07-28. ^ Archibold, Randal C. (2012-03-24). "Homicides in El Salvador Drop, and Questions Arise". The New York Times. ^ Honduras among world's most dangerous places – News. JamaicaObserver.com (2012-04-10). Retrieved 2012-07-28. ^ Reuters (30 December 2014). "El Salvador: Murder Rate Soars" – via NYTimes.com. 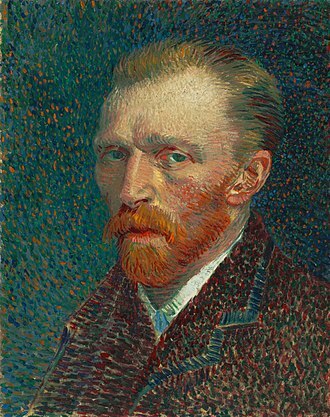 ^ '+comment.find('name').text()+' (2012-03-10). "El Salvador: Reward program encourages crime-fighting tip". Infosurhoy.com. Archived from the original on 2013-02-16. Retrieved 2013-06-15. ^ a b "Pobladores prehispánicos inventaron las pupusas". Elsalvador.com. 2003-10-31. Archived from the original on 2011-05-03. Retrieved 2010-05-02. ^ "Culture of El Salvador – traditional, history, People, clothing, women, beliefs, food, customs, family". everyculture.com. ^ "Estadio Cuscatlán". 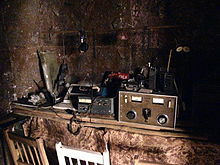 Radio Guanaca. Retrieved 25 February 2014. "Background Notes", Background Notes: El Salvador, January 2008. Retrieved March 6, 2008. Bonner, Raymond. Weakness and Deceit: U.S. Policy and El Salvador. New York: Times Books, 1984. CIA World Factbook, "El Salvador", February 28, 2008. Retrieved March 6, 2008. "Country Specific Information", U.S. State Department, October 3, 2007. Retrieved March 6, 2008. Danner, Mark. The Massacre at El Mozote: A Parable of the Cold War. New York: Vintage Books, 1994. Montgomery, Tommie Sue. Revolution in El Salvador: From Civil Strife to Civil Peace. Boulder, Colorado: Westview Press, 1995. Stadler, Sidney. It started with an oyster. The Memoirs of Sidney M. Stadler, CBE. Penna Press 1975. Autobiography of a British businessman and diplomat in El Salvador, with much on Salvadoran society and politics from the 1920s to 1950s. Vilas, Carlos. Between Earthquakes and Volcanoes: Market, State, and the Revolution America. New York: Monthly Review Press. 1995. Embassy of El Salvador in London – Content rich site about every aspect of Salvadorean life, government, business, and politics. "El Salvador". The World Factbook. Central Intelligence Agency. It is a government where the head of state is not a monarch. Both modern and ancient republics vary widely in their ideology, composition, in the classical and medieval period of Europe, many states were fashioned on the Roman Republic, which referred to the governance of the city of Rome, between it having kings and emperors. The Italian medieval and Renaissance political tradition, today referred to as humanism, is sometimes considered to derive directly from Roman republicans such as Sallust. 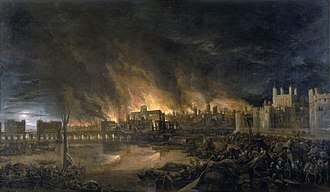 Republics were not equated with classical democracies such as Athens, but had a democratic aspect, Republics became more common in the Western world starting in the late 18th century, eventually displacing absolute monarchy as the most common form of government in Europe. 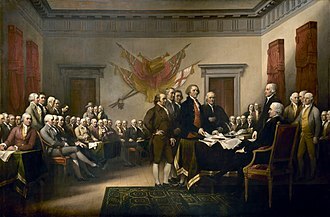 In modern republics, the executive is legitimized both by a constitution and by popular suffrage, for instance, Article IV of the United States Constitution guarantee to every State in this Union a Republican form of Government. The term originates as the Latin translation of Greek word politeia, among other Latin writers, translated politeia as res publica and it was in turn translated by Renaissance scholars as republic. The term politeia can be translated as form of government, polity, or regime, and is therefore not always a word for a specific type of regime as the modern word republic is. And amongst classical Latin, the term republic can be used in a way to refer to any regime. In medieval Northern Italy, a number of city states had commune or signoria based governments, in the late Middle Ages, such as Giovanni Villani, began writing about the nature of these states and the differences from other types of regime. They used terms such as libertas populi, a free people, the terminology changed in the 15th century as the renewed interest in the writings of Ancient Rome caused writers to prefer using classical terminology. To describe non-monarchical states writers, most importantly Leonardo Bruni, adopted the Latin phrase res publica. While Bruni and Machiavelli used the term to describe the states of Northern Italy, which were not monarchies, the term can quite literally be translated as public matter. 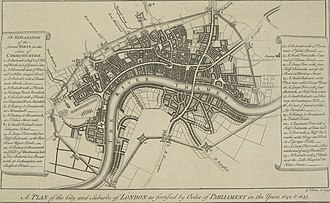 It was most often used by Roman writers to refer to the state and government, in subsequent centuries, the English word commonwealth came to be used as a translation of res publica, and its use in English was comparable to how the Romans used the term res publica. San Salvador is the capital and largest city of El Salvador and its eponymous department. It is the political, cultural and financial center. As a gamma global city, San Salvador is an important financial hub of Central America, San Salvador is located in the Salvadoran highlands, surrounded by volcanoes and prone to earthquakes. The city is home to the Catholic Archdiocese, as well as many Protestant branches of Christianity, including Evangelicals, Latter-day Saints, Baptists. San Salvador has the second largest Jewish community in Central America, San Salvador has been the host city for various regional and international sporting and social events. It hosted the Central American and Caribbean Games in 1935 and 2002, San Salvador was the host city of the 18th Ibero-American Summit, held October 29–31,2008, the most important sociopolitical event in the Spanish and Portuguese sphere. The Central American Integration System has its headquarters in San Salvador, the Central American Bank for Economic Integration has its headquarters in San Salvador. Before the Spanish conquest, the Pipil people established their capital, not much is known about Cuzcatlan, as it was abandoned by its inhabitants in an effort to avoid Spanish rule. Under the orders of conquistador Pedro de Alvarado, his associates Gonzalo de Alvarado and Diego de Holguín occupied the empty settlement, Diego de Holguín became the first mayor of San Salvador after the town was founded on April 1,1525. The town changed location twice, in 1528 and 1545, the new site was chosen because it had more space and more fertile land, thanks to the Acelhuate River. The population of the city remained relatively small until the early 20th century, in January 1885, during the presidency of Dr. Rafael Zaldivar, a group of businessmen and the presidents family contributed funds for building the Sara Zaldivar Asylum for Indigents and the Elderly. In 1902, the Hospital Rosales was built, named after its benefactor, Dr. Jose Rosales, the hospitals construction was begun by president Carlos Ezeta and finished during the presidency of Tomás Regalado. This is so fundamental to traffic flow that it is sometimes referred to as the rule of the road. About two-thirds of the population use RHT, with the remaining 76 countries and territories using LHT. Countries that use LHT account for about a sixth of the worlds area, in the early 1900s some countries including Canada and Brazil had different rules in different parts of the country. During the 1900s many countries standardised within their jurisdictions, and changed from LHT to RHT, in 1919,104 of the worlds territories were LHT and an equal number were RHT. From 1919 to 1986,34 of the LHT territories switched to RHT, many of the countries with LHT are former British colonies in the Caribbean, Southern Africa, Southeast Asia and New Zealand. Japan, Nepal, Mozambique, East Timor, in Europe, only four countries still drive on the left, the United Kingdom, Ireland and Cyprus, all of which are islands. Nearly all countries use one side or the other throughout their entire territory, most exceptions are due to historical considerations and involve islands with no road connection to the main part of a country. China is RHT except the Special Administrative Regions of China of Hong Kong, the United States is RHT except the United States Virgin Islands. The United Kingdom is LHT, but its overseas territories of Gibraltar, according to the International Regulations for Preventing Collisions at Sea, water traffic is RHT. For aircraft the US Federal Aviation Regulations provide for passing on the right, light rail vehicles generally operate on the same side as other road traffic in the country. Many countries use RHT for automobiles but LHT for trains, often because of the influence of the British on early railway systems, in some countries rail traffic remained LHT after automobile traffic switched to RHT, for example in China and Argentina. However, France and Switzerland have used RHT for automobiles since their introduction, there is no technical reason to prefer one side over the other. Ancient Greek and Roman troops kept to the left when marching, in 1998, archaeologists found a well-preserved double track leading to a Roman quarry near Swindon. Ethnically,86. 3% of Salvadorans are mixed. Another 12. 7% is of pure European descent, other 0. 23% are pure indigenous descent,0. 13% black people, El Salvadors population was 6,377,358 in 2015, compared to 2,200,000 in 1950. In 2010 the percentage of the population below the age of 15 was 32. 1%, 61% were between 15 and 65 years of age, while 6. 9% were 65 years or older. The migration rate accelerated during the period of 1979 to 1981, this marked the beginning of the civil unrest and the spread of political killings. In addition small Salvadoran communities sprung up in Canada, Belize, Costa Rica, Taiwan, the 2010 U. S. Census counted 1,648,968 Salvadorans in the United States, up from 655,165 in 2000. 86. 3% of the population are mestizo, having mixed indigenous, according to the Salvadoran Government, about 0. 23% of the population are of full indigenous origin. There are small populations of Cacaopera people in the Morazán Department, according to the National Salvadoran Indigenous Coordination Council and CONCULTURA, approximately 600,000 or 10 per cent of Salvadorian peoples are indigenous. Nonetheless, very few Amerindians have retained their customs and traditions and cities in the country with notable indigenous populations include Sonsonate and Panchimalco, in the department of San Salvador. This population is made up of ethnically Spanish people, while there are Salvadorans of French, Swiss, Irish. There are a significant population who is of Arab descent, mostly from Palestine, Salvadorans of Palestinian descent numbered around 70,000 individuals, while Salvadorans of Lebanese descent is around 25,000. There is a community of Jews who came to El Salvador from France, Morocco, Tunisia. Pardo is the term that was used in colonial El Salvador to describe a tri-racial Afro-Mestizo person of Indigenous, afro-Salvadorans are the descendants of the African population that were enslaved and shipped to El Salvador to work in mines in specific regions of El Salvador. Thus, there remains no significant extremes of African physiognomy among Salvadorans like there is in the countries of Central America. Salvadorans are people who identify with El Salvador. Most Salvadorans live in El Salvador, although there is a significant Salvadoran diaspora, particularly in the United States, El Salvadors population was 6,218,000 in 2010, compared to 2,200,000 in 1950. In 2010 the percentage of the population below the age of 15 was 32. 1%, 61% were between 15 and 65 years of age, while 6. 9% were 65 years or older. In addition small Salvadoran communities sprung up in Canada, Belize, Costa Rica, the 2010 U. S. Census counted 1,648,968 Salvadorans in the United States, up from 655,165 in 2000. By 2014, the figured had risen to over 2.1 million, the majority of the Salvadoran population is mestizo or white are 99% of the total population. In the 2007 census,86. 3% of the population self-identified as mestizo, having mixed indigenous, according to the official 2007 Census in El Salvador,12. 7% of Salvadorans self-identified with being white. A majority of Central European immigrants in El Salvador arrived during World War II as refugees from the Czech Republic, Hungary, There are a small community of Jews, Palestinian Christians, and Arab Muslims. Among the immigrant groups in El Salvador, Palestinian Christians stand out, though few in number, their descendants have attained great economic and political power in the country. The official 2007 Census 0. 2% of the population are of indigenous origin. Very few Amerindians have retained their customs and traditions, having over time assimilated into the dominant Mestizo/Spanish culture, There is a small Afro-Salvadoran population, with 0. 1% identifying as Black. Many have traditionally been prevented from immigrating via government policies, in the 2007 census,0. 7% of the population was considered as other. There are up to 100,000 Nicaraguans living in El Salvador, Spanish is the language spoken by virtually all inhabitants. Spanish, Salvadoran Sign Language, Kekchí, immigrant languages include Chinese, Arabic and American Sign Language. Definition, age 10 and over can read and write total,95. 0% male,94. 4% female,95. 5% urban,97. 2% rural,91. 8% There is diversity of beliefs in El Salvador. With an estimated population of around 15.8 million, it is the most populated state in Central America. Guatemala is a democracy, its capital and largest city is Nueva Guatemala de la Asunción. The territory of modern Guatemala once formed the core of the Maya civilization, most of the country was conquered by the Spanish in the 16th century, becoming part of the viceroyalty of New Spain. Guatemala attained independence in 1821 as part of the Federal Republic of Central America, from the mid to late 19th century, Guatemala experienced chronic instability and civil strife. Beginning in the early 20th century, it was ruled by a series of dictators backed by the United Fruit Company, in 1944, authoritarian leader Jorge Ubico was overthrown by a pro-democratic military coup, initiating a decade-long revolution that led to sweeping social and economic reforms. A U. S. -backed military coup in 1954 ended the revolution, from 1960 to 1996, Guatemala endured a bloody civil war fought between the US-backed government and leftist rebels, including genocidal massacres of the Maya population perpetrated by the military. As of 2014, Guatemala ranks 31st of 33 Latin American and Caribbean countries in terms of the Human Development Index, Guatemalas abundance of biologically significant and unique ecosystems includes a large number of endemic species and contributes to Mesoamericas designation as a biodiversity hotspot. The country is known for its rich and distinct culture. The name Guatemala comes from the Nahuatl word Cuauhtēmallān, or place of many trees and this was the name the Tlaxcaltecan soldiers who accompanied Pedro de Alvarado during the Spanish Conquest gave to this territory. 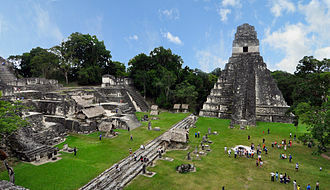 The first evidence of habitation in Guatemala dates back to 12,000 BC. Evidence, such as obsidian arrowheads found in parts of the country. There is archaeological proof that early Guatemalan settlers were hunters and gatherers, pollen samples from Petén and the Pacific coast indicate that maize cultivation had been developed by 3500 BC. Sites dating back to 6500 BC have been found in the Quiché region in the Highlands, archaeologists divide the pre-Columbian history of Mesoamerica into the Preclassic period, the Classic period, and the Postclassic period. 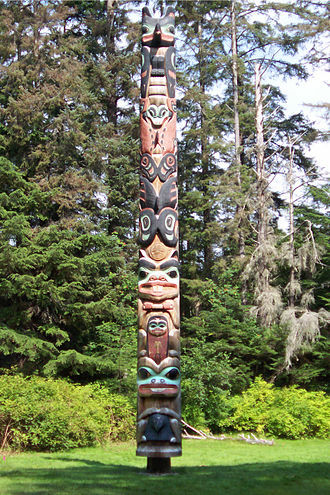 The indigenous peoples of the Americas are the pre-Columbian peoples of the Americas and their descendants. The term Amerindian is used in Quebec, the Guianas, Indigenous peoples of the United States are commonly known as Native Americans or American Indians, and Alaska Natives. Application of the term Indian originated with Christopher Columbus, who, in his search for Asia, the Americas came to be known as the West Indies, a name still used to refer to the islands of the Caribbean Sea. This led to the blanket term Indies and Indians for the indigenous inhabitants, although some indigenous peoples of the Americas were traditionally hunter-gatherers—and many, especially in the Amazon basin, still are—many groups practiced aquaculture and agriculture. The impact of their agricultural endowment to the world is a testament to their time, although some societies depended heavily on agriculture, others practiced a mix of farming and gathering. In some regions the indigenous peoples created monumental architecture, large-scale organized cities, chiefdoms and empires. Many parts of the Americas are still populated by peoples, some countries have sizable populations, especially Belize, Chile, Greenland, Mexico. At least a different indigenous languages are spoken in the Americas. Some, such as the Quechuan languages, Guaraní, Mayan languages, many maintain aspects of indigenous cultural practices to varying degrees, including religion, social organization, and subsistence practices. Like most cultures, over time, cultures specific to many indigenous peoples have evolved to incorporate traditional aspects, some indigenous peoples still live in relative isolation from Western culture and a few are still counted as uncontacted peoples. 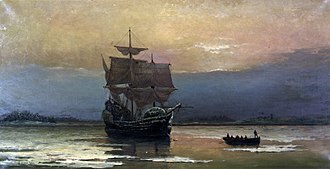 The specifics of Paleo-Indian migration to and throughout the Americas, including the dates and routes traveled, are the subject of ongoing research. According to archaeological and genetic evidence and South America were the last continents in the world with human habitation. During the Wisconsin glaciation, 50–17,000 years ago, falling sea levels allowed people to move across the bridge of Beringia that joined Siberia to northwest North America. San Salvador as darkness descends on the greater metropolitan area. Las castas. 18th century, Museo Nacional del Virreinato, Tepotzotlán, Mexico. 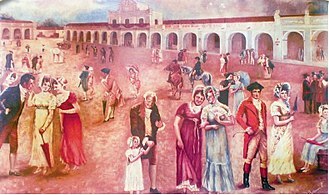 Painting of the First Independence Movement celebration in San Salvador, El Salvador. At the center, José Matías Delgado, a Salvadoran priest and doctor known as El Padre de la Patria Salvadoreña (The Father of the Salvadoran Fatherland), alongside his nephew Manuel José Arce, future Salvadoran president of the Federal Republic of Central America. 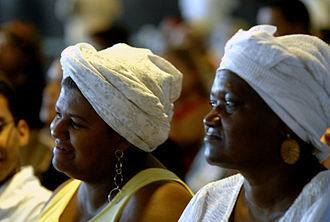 Brazilian Quilombolas during a meeting in the capital of Brazil, Brasília. Indigenous Salvadoran woman from Panchimalco. The iconic Jesus statue Monumento al Divino Salvador del Mundo, a landmark located in the country's capital, San Salvador. 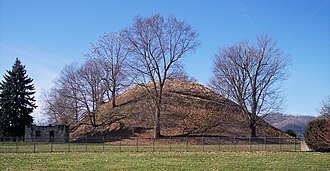 Ananda Stupa, built by the Licchavis at Vaishali, which served as the capital of Vajjian Confederacy, one of the world's earliest republics (Gaṇa sangha). Giovanni Battista Tiepolo, Neptune offers the wealth of the sea to Venice, 1748–1750. 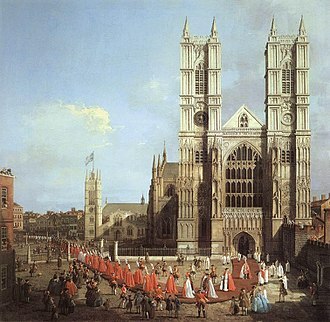 This painting is an allegory of the power of the Republic of Venice. 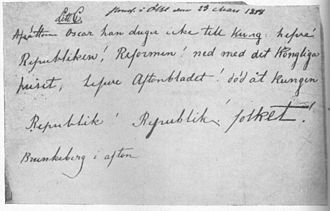 A revolutionary Republican hand-written bill from the Stockholm riots during the Revolutions of 1848, reading: "Dethrone Oscar he is not fit to be a king: Long live the Republic! The Reform! down with the Royal house, long live Aftonbladet! death to the king / Republic Republic the People. Brunkeberg this evening". The writer's identity is unknown. El Salvador 10 Colones banknote of 1959. A Maya stela, an emblematic symbol of the Honduran Mayan civilization at Copan. The Fortaleza de San Fernando de Omoa was built by the Spanish to protect the coast of Honduras from English pirates. The five rowed volcanos in the coat of arms were inspired by the Cordillera de Apaneca volcanic range when El Salvador's Sonsonate City was the second capital of the Federal Republic of Central America in 1834. Image: " The Maya People "
Economic activity of El Salvador, 1980. Vegetation and land use, 1980. 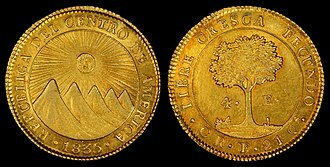 Federal Republic of Central America, 4 real (1835). Struck in the San Jose, Costa Rica mint (697 were minted). 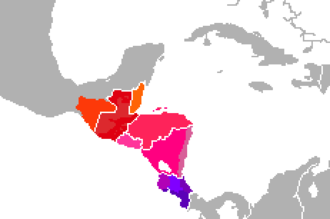 Linguistic variations of Central American Spanish.